Broward County is the 2nd most populated county in the state of Florida. It is also the 16th most populated in the United States. 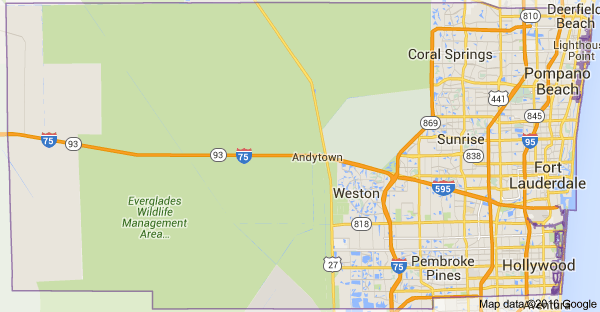 Established March 27 1911 its primary residents at the time were Aboriginal Natives and Tequesta Indians. Ft Lauderdale, being the county seat, was the site of the 2nd Seminole War and was soon abandoned in 1842. This area which was built in 1838, was known in the 20th century as “ New River Settlement”. The East Coast Railroad built tracks through this area in 1890. Ft Lauderdale, the city, was incorporated in 1911 and became the county seat in 1915. It was first developed in the 1920's with the land boom in the area. In 1926 there was a devastating hurricane and in 1930 came the Great Depression which both caused great economic dislocation for many. During World War II a Major US Naval Base took over the area with an Air Station to train pilots, radar and fire control operators. Meanwhile the Coast Guard set up a base nearby at Port Everglades. Today Ft Lauderdale is a major yachting center with 10.5 million people touring the area each year. Many people enjoy everything from Arts to parks and cruises that are in the immediate area. Now the area boasts numerous museums and attractions. It is also home to several professional sports teams. Visitors come from all over the world, especially from South America and Europe. Ft. Lauderdale is home for many law firms, accounting firms and financial planners. Banking and financial services are a large part of the economy. There are also numerous manufacturing and service businesses that call this home.